Garden container that looks like a rabbit or bunny. Made of real terracotta clay. Our smiling terra cotta bunny garden planter is so sweet that you have to have one. With long floppy ears and a little cotton tail, this home and garden planter is sure to bring a smile to your face. Fill each animal pot with colorful bulbs, green houseplants or succulents and create a clever way to display your favorite flowers. At Easter, you can make a playful Easter Basket by filling the back with treats, hand tools, and garden gloves. 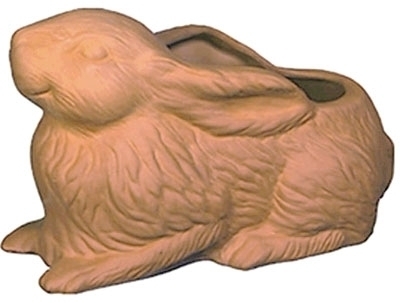 Just tie a ribbon around its neck of this rabbit garden pot and you have the perfect gift for a gardener. Garden pots can be functional and forgettable but our animal planters are unique and really add a personal touch to your landscape decor.